From Boston’s Financial District to the suburbs, housing prices in Massachusetts have been rising everywhere. Jamaica Plain was known to be an affordable area but the housing market in the neighborhood has experienced a significant increase in prices over the past few decades. A research by NeighborhoodX (a real estate research site) has shown that the condo prices in Jamaica Plain have increased by 156% over the past 16 years. The average condo prices have inflated from $160/sq. ft. to $440/sq. ft. from 2000 to 2016. 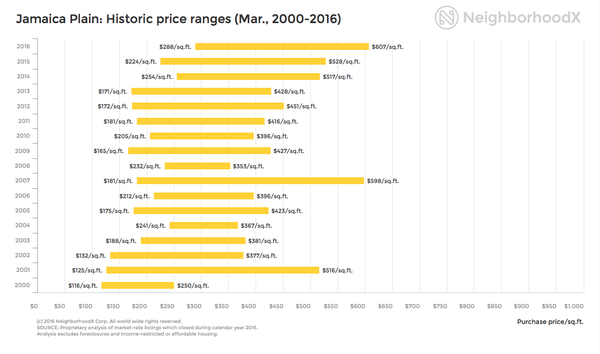 The chart below shows change in prices from year-to-year.